France is growing impatient with the lack of progress on reaching a political solution to the crisis in Libya, but officials denied Paris is in talks with Gaddafi’s government or could consider him not quitting power. Remarks by Defence Minister Gerard Longuet saying rebels should start direct negotiations with Gaddafi’s camp, and a report that Paris was talking to the Libyan leader, pointed to a growing restlessness in Paris about the stalemate. But French officials denied any shift in position and said Paris had merely sent messages to Tripoli via intermediaries making clear the Libyan leader must relinquish power and withdraw his troops to enable a political solution. “There are no direct negotiations between France and the Gaddafi regime, but we pass messages through the rebel council(TNC) and our allies,” foreign ministry spokesman Bernard Valero said, asked about comments by Saif al-Islam, one of Gaddafi’s sons, saying Tripoli was in talks with the French government. “France wants a political solution, like we have always said,” Valero said in an online media briefing. 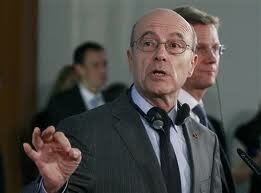 “There is no change of course in the French position,” a defence ministry source said, asked about Longuet’s remarks. Concerned about the mounting cost of the military campaign and the prospect of it running on into the start of a 2012 election campaign, France wants the opposition rebels it is supporting to do more to help end the conflict, as it struggles to make headway in its own dialogue with Gaddafi’s camp. Diplomatic sources close to the matter said envoys from Paris and Tripoli have met in Paris, Brussels and Tunisia in recent weeks, but have made little progress. One said talks in Paris last month between Sarkozy and a Gaddafi aide fell through in minutes when the envoy talked of Gaddafi staying until elections. Analysts say the financial and political cost of the Libyan air campaign are putting France and Britain under pressure, as the campaign they spearheaded heads toward its fifth month. “For France and Britain, the reality of the mission is setting in. It is clear therefore that Paris is moving ahead on negotiations with Gaddafi, floating the possibility of leaving (him) in the country,” said Stratfor analyst Marko Papic. He said the political costs of leaving Gaddafi’s camp in control of Western Libya could be lower for the allies than the cost of continuing with military action stuck in stalemate. Longuet, appointed defence minister in a February reshuffle, is known for sometimes speaking out of line, but his remarks were nonetheless an indication that France is growing restless. “The underlying fear remains a protracted campaign that intrudes onto the French election season, embarrassing Sarkozy and leaving the French (and British) isolated,” said Shashank Joshi of Britain’s Royal United Services Institute. Al-Islam was quoted in Algeria’s El Khabar newspaper on Monday as saying that Gaddafi’s administration was talking directly to Paris, and not to the rebels. Valero told Reuters France wanted to accelerate the process of planning for a post-Gaddafi era, but noted it is not up to France to say who would participate in a new Libya. “At no point have we excluded members close to Gaddafi (from consultations) as long as they don’t have blood on their hands,” he said. Foreign Minister Alain Juppe said the NATO-led alliance must keep up its military pressure on Gaddafi and stressed that his standing down was a condition for an end to the conflict. “We need to keep up the military pressure because apparently Gaddafi is failing to understand what is bound to happen for him,” Juppe told reporters during a visit to Mauritania. In an interview with the regional daily Sud Ouest, he left open the possibility of Gaddafi remaining in Libya, however. After meeting African Union negotiators in Addis Ababa at the weekend, Juppe said the group now accepted Gaddafi must quit and that meant its peace initiative could move forward. Leaders of Libya’s rebel transition council are due to meet with NATO and European Union officials this week in Brussels before a meeting of the Libya coalition in Istanbul on Friday.